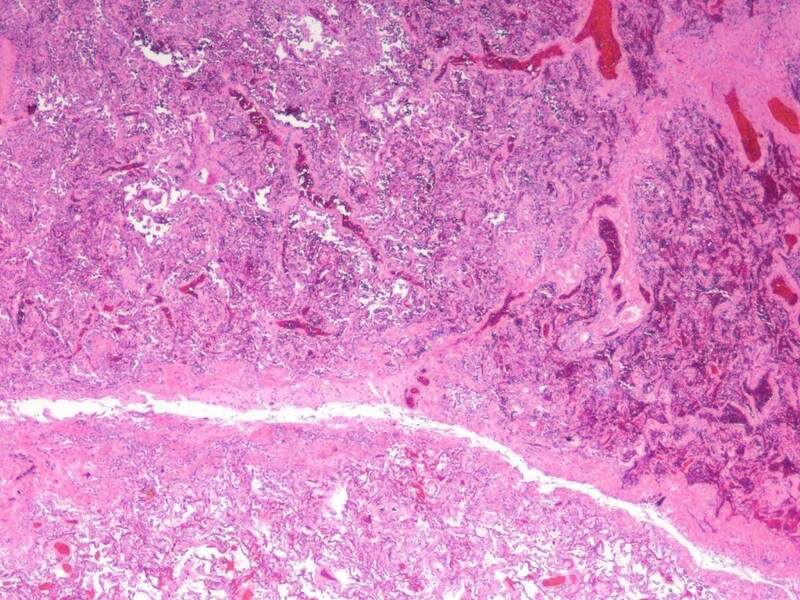 The wedge resection of lung reveals a subpleural area of fibrosis with central necrosis surrounding by a peripheral rim atypical epithelioid cells. Cytologically, the individual cells are epithelioid with pale pink cytoplasm, high nuclear-to-cytplasmic ratios, prominent nucleoli and frequent mitotic figures. Architecturally, the atypical cells appear to be either making or lining slit-like and alveolar-like spaces, giving the impression of either vascular formation or an alveolar growth pattern. The patient has a history of a forearm epithelioid sarcoma. 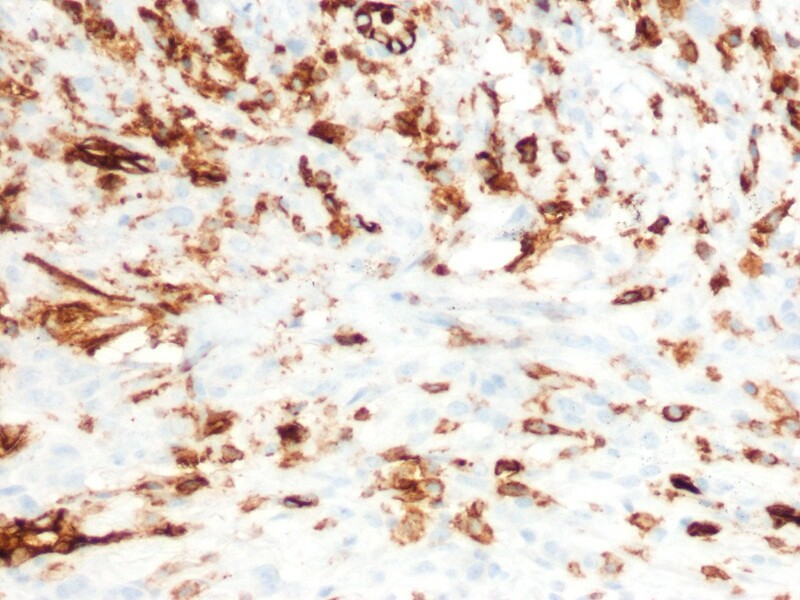 Immunostains on the lung lesion reveal it to be positive for AE1/AE3 and CD34, and negative for CD31, with loss of INI-1 labeling. The wedge resection of lung reveals an atypical epithelioid proliferation that has a slit-like (pseudo-vascular) or alveolar-like growth pattern, mimicking a vascular neoplasm, lung adenocarcinoma in situ (bronchioalveolar carcinoma), or adenocarcinoma with lepidic growth. 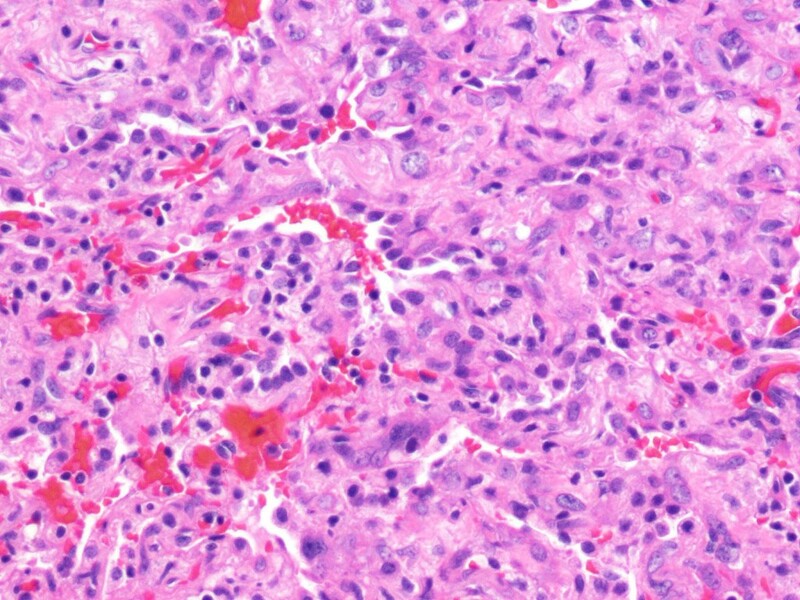 Indeed, without the clinical history of a known epithelioid sarcoma of soft tissue diagnosed six years prior, the diagnosis of metastatic epithelioid sarcoma a priori would be very difficult. As always, clinical history is key. 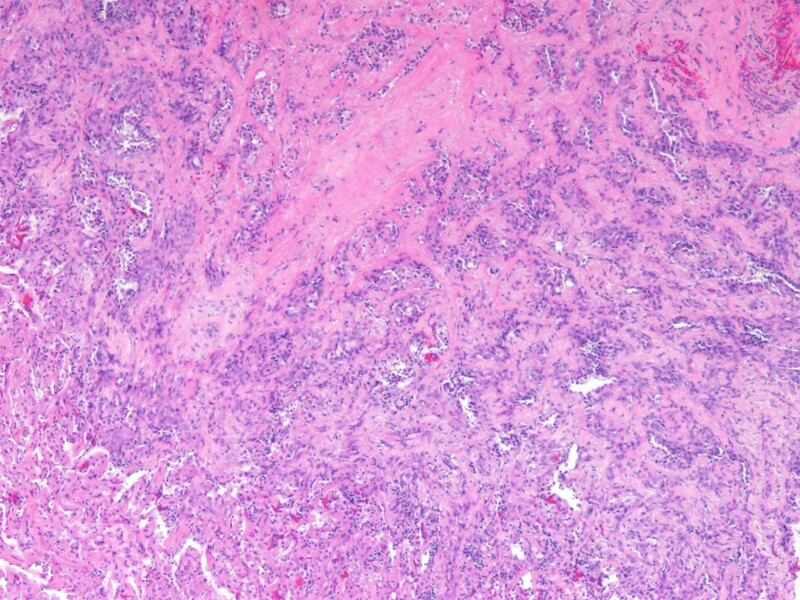 Primary epithelioid sarcomas most commonly involve the distal extremities, characteristically display nodular growth with associated granulomatous inflammation, and are unique among sarcomas in that they can metastasize to lymph nodes and may develop late metastatic spread. 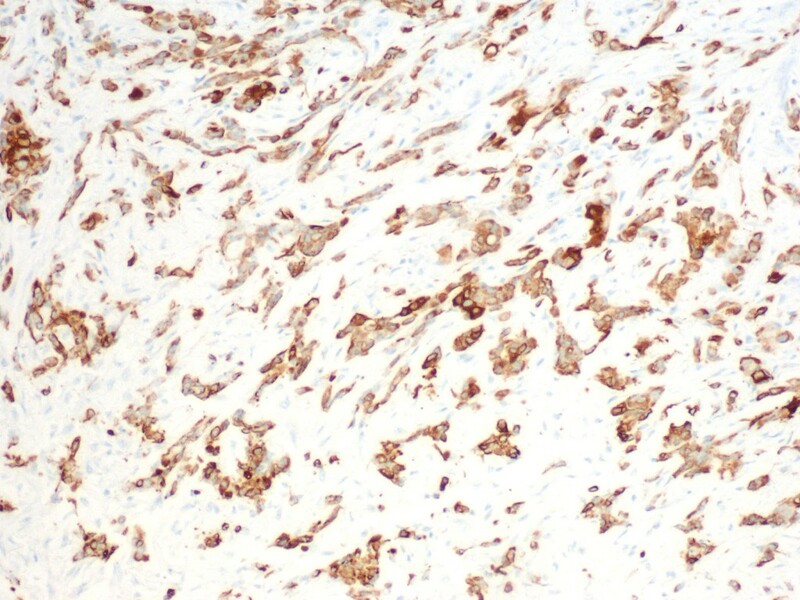 The immunopanel performed in this case includes a cytokeratin (AE1/AE3), “vascular markers” CD31 and CD34, and INI-1, which are stains that cover the entities of carcinoma, angiosarcoma, and epithelioid sarcoma. 1. Hollmann TJ, Hornick JL. INI1-deficient tumors: diagnostic features and molecular genetics. Am J Surg Pathol. 2011 Oct;35(10):e47-63.